Hemodialysis users are at high risk for bloodstream and vascular access infections. 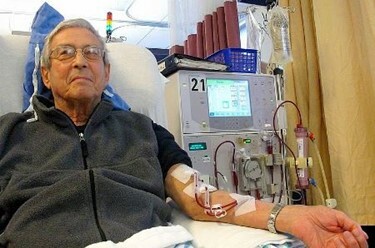 Although central venous catheters (CVCs) are used in only 19 percent of dialysis procedures in the United States, they are responsible for 70 percent of vascular access–related bloodstream infections (BSIs), according to a report in the Clinical Journal of American Society of Nephrology. In addition, BSIs are the second-leading cause of death among patients undergoing hemodialysis who use catheters for their vascular access. This was the clinical problem Pursuit Vascular founder Bob Ziebol set out to solve in 2009. It is a problem that the American Society of Nephrology, the Centers for Disease Control and Prevention (CDC), and the U.S. Food and Drug Administration (FDA) have long been aware of and sought to improve. According to the CDC, a CVC-associated BSI is a serious infection that occurs when germs (usually bacteria or viruses) enter the bloodstream through the central line. Thus, healthcare providers follow a strict protocol when inserting the line to ensure it remains sterile and an infection does not occur. In addition to proper central line insertion, healthcare providers use stringent infection control practices each time they access the line. While this helped, infection remains a problem, because these procedures do not kill the germs inside the catheter hub. Pursuit Vascular developed the ClearGuard HD Antimicrobial Barrier Cap to kill germs inside the catheter hub and to improve the safety of hemodialysis using a catheter. In 2013, the company was ready to pursue FDA clearance through the FDA 510(k) process. The company found a predicate device and a reference device, but CEO Doug Killion felt FDA clearance was a long shot, because the predicate device was a full hemodialysis catheter with accessories — one of which happened to be a cap. Further, the reference device was a catheter coated with the same drug Pursuit Vascular was using to reduce the risk of infection. Later that year, Pursuit Vascular was showing the product at the American Society of Nephrology (ASN) meeting, in the pre-FDA clearance area of the floor, when their FDA reviewer and branch chief came by to meet them. Although Pursuit Vascular submitted a 510(k), rather than a De Novo application, the path that FDA followed in working with the company almost seems more in line with the latter. Perhaps this is a sign of things to come, as the FDA has certainly been seeing more De Novo applications in the last few years. Killion believes what most interested the FDA about the the ClearGuard HD cap was its pinch clamps on the catheter extension lines. He explained that the clamps keep the antimicrobial agent in the hub region of the catheter, where it is most effective, and they mechanically prevent the drug from entering the bloodstream. Killion sees these clamps as the differentiator that compelled the FDA to clear ClearGuard HD to market under the new product code, even as competing liquid lock products remained mired in additional pre-market testing requirements. “I think we even surprised the big dialysis providers… I think they were surprised and probably a bit shocked that we got [510(k) clearance] so quickly,” Killion concluded. But initial 510(k) clearance marked only the first part of the product’s journey, explained Ziebol. “In 2013, the indication cleared by our 510(k) was for reducing bacteria inside the catheter hub; we didn’t have data to show the reduction of bloodstream infections, which is really a very different claim,” he said. Very different, indeed, but Pursuit Vascular’s strategy to obtain clearance for bacterial reduction first would pave the way for future success. The company was able to use its ClearGuard HD caps in subsequent clinical trials to expand labeling claims to include the reduction of central line-associated BSIs. “Beginning in 2014, two large, randomized clinical studies were run: first, a year-long study with Fresenius, then a 13-month study with DaVita, which produced the data we submitted to the FDA for our 2018 510(k) clearance,” Ziebol explained. Obtaining early clearance with a narrower claim enabled Pursuit Vascular to enter the market earlier and benefited the company by enabling it to use its own product as a predicate to collect real-world evidence — all while obtaining broader clearance and avoiding the requirement to document patient-informed consent during their trials, since the device had been previously cleared. Overall, it was great to hear of a company having a very positive experience with the FDA during its pathway to market. I love it when everybody wins: medical device companies, the FDA, medical device professionals, and —most importantly — patients.